I spent a delightful day learning how to use my gelli plate last week. I have had it for years and only used it once or twice so everything my friends showed me was new and exciting. 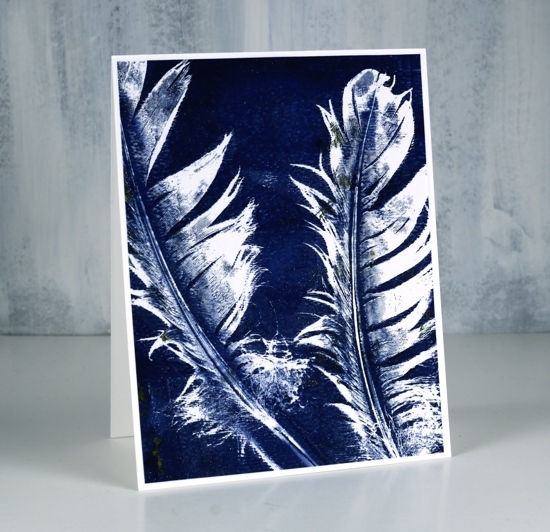 I was so happy with these feather prints, I couldn’t believe the detail using real feathers. If you want to see how it’s done check out this video on the gelli arts youtube channel. I did a few with navy and shimmery gold paint as well as some with burgandy and gold. Half of them got sentiments but only small ones as I didn’t want to cover up the lovely detail. I had a MFT sentiment already stamped and die cut which matched the panel below. 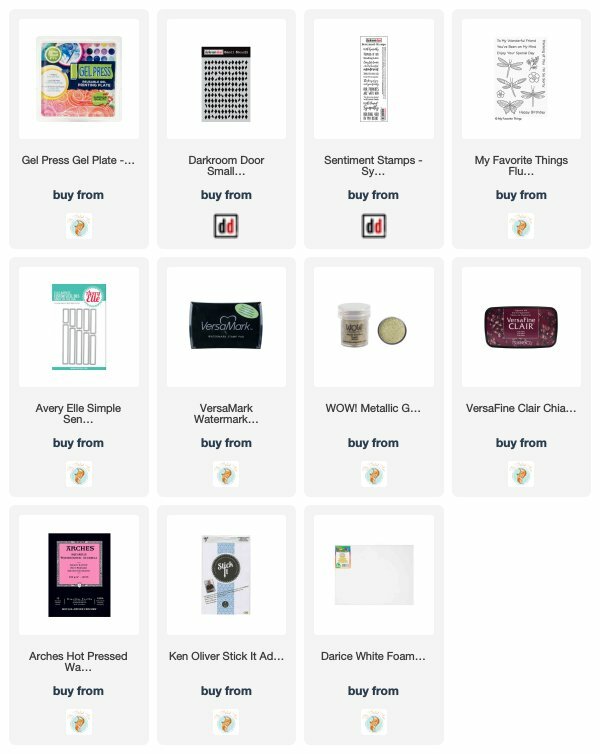 I haven’t listed or linked any of the paints because I don’t remember what brands I used or colour names. If I continue with my gelli plate (and I’m pretty sure I will!) I will let you know what paints I buy. My favourite panel is the one at the top of the post which also has the texture of the new ‘diamonds’ stencil from Darkroom Door in the background. As I was learning and experimenting I used computer paper for most prints, not the weight of cardstock I would usually use for panels on my cards. To make sure I didn’t tear or buckle the panels with glue or narrow adhesive I covered the back of all the panels with double sided adhesive sheets. 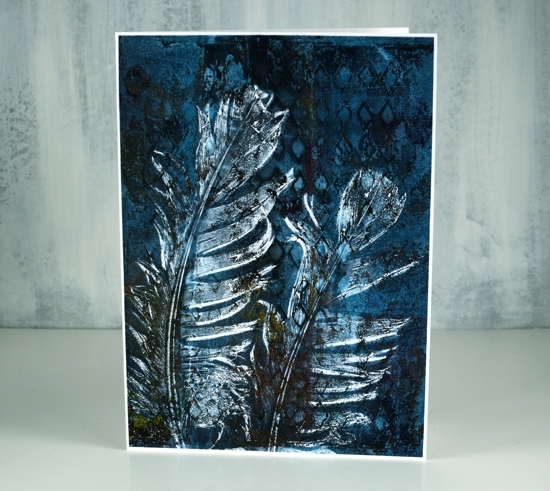 Have you used a gelli plate? I love to hear what your favourite techniques are. These are gorgeous. I love the depth of colour you have. I will have to watch that tutorial. I try things from different videos. Doing magazine prints was exciting. It took a few goes to get it to work. Lydia Fiedler has a video on it. I did try a couple of magazine prints with varied results. I will definitely try again and watch Lydia’s video. These are wonderful! 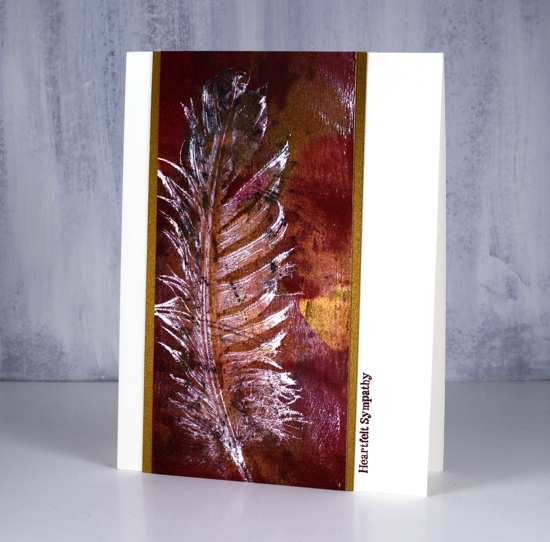 I’ve used feathers for stamping and spraying, but not with my Gelli plate. Used mostly stencils and stamps with it, layering them. I haven’t used mine much, but each time I’ve had a lot of usable fun card backgrounds, and a great, happy mess in a very short time. Looking forward to seeing where you go with it. Thank you for sharing! I did get a lot of panels done when I had the gelli plate out; some I tossed out but there are a few more favourites I will turn into cards or journal pages. I can’t wait to get it out again. Absolutely incredible, Heather! These look for all the world like paintings. Cannot wait to watch the video and land myself into another paint-y mess on my dining room table. Thank you. They do look like paintings which is why I didn’t add sentiments to all of them. I love the pops of gold paint. These are lovely! I’ve tried the Gelli plate a few times but haven’t been all that successful! Your work makes me interested to try it again – thank you so much! I was the same; I’d tried it twice by myself but when I was with friends who have used theirs a lot I was able to make a lot more progress. I am going to get mine out again and try techniques from the Gelli arts youtube channel. Oh Clelie, thank you for your lovely message. You are such an encouragement to me. I am excited to try many more techniques with my gelli plate. WOW! Something else to learn. These are fantastic, Heather, not only the prints but the way you’ve used them. Hope to see more! 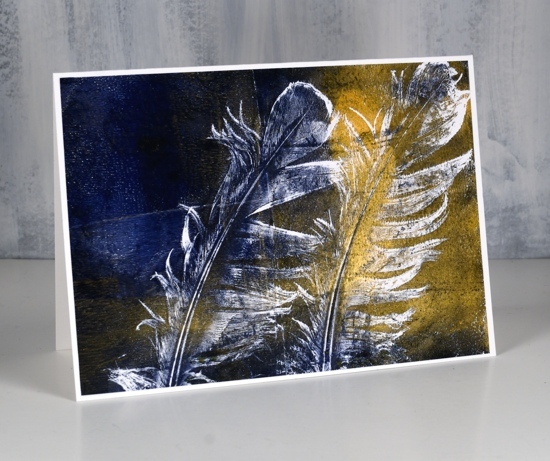 Hi Heather, I love, love, love these feather monoprints from your gelli plate. I love the colours you have used and depth of the image. I watched the video you mentioned. Like you, I have had a plate for a few years, played with it one day, didn’t like what I made and never went back. ( a bit like roller skates when I was a kid….first day, fell over, never went back on them! ) I will find the time to practise and keep going this time. 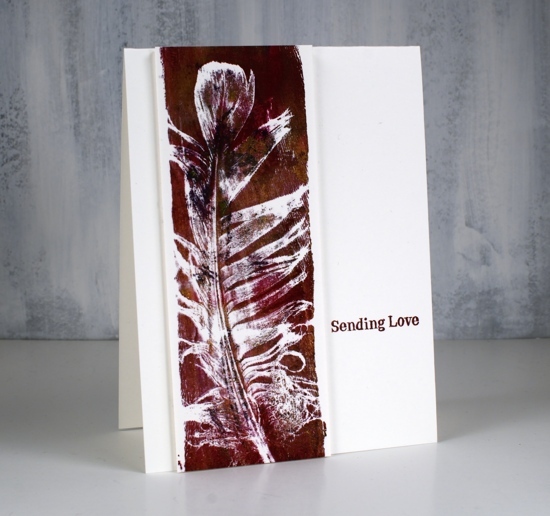 Looking forward to seeing more of your gelli pieces. Thanks for the wonderful inspiration. 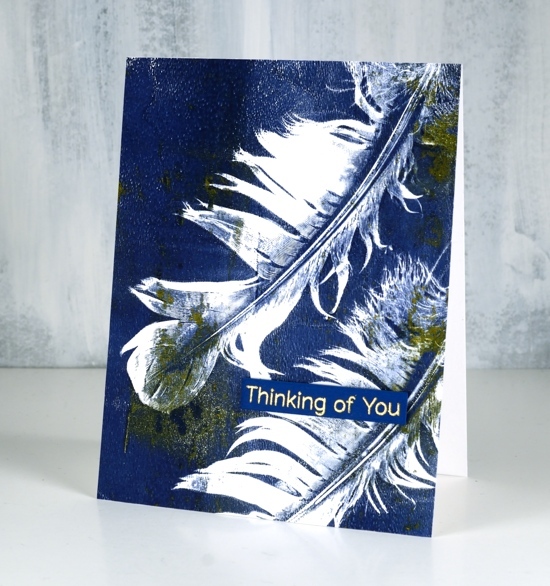 I have to give credit to my friends who invited me to come and join them in their gelli printing and showed me several very cool techniques including this one with the feathers! These feathers are gorgeous! I must try this! thank you for experimenting and sharing your experience and results. I really like how the feather prints turned out. I agree with you; the gelli plate needs to come out from hiding more often! there you go again. Coming up with such incredible ideas. I felt a geli plate was just another tool that you could use something else instead of the “original ” plate. Needless to say, I never bothered experimenting and thus, never bought anything. But, seeing this video and your breathtaking cards, I had to check out the website and discovered that the price was not so bad. Therefore, my next buy. I have feathers I collected over years, not sure what to do with. Now I am eager to try and will amaze my friends, just as you have amazed us. I forgot to add that I particularly like the way the blue and white feather stands out. What is your second color? you said navy and gold was used..but not sure if that is what you meant on the one that looks all blue but with white looking feathers. I think that one is all blue with maybe a bit of left over gold here and there. The white is just the paper. I am all excited about trying new things with my plate but as I have never been a fan of acrylic paint I don’t have any on hand for gelli printing. Meanwhile I am watching all the videos! Oh, how fun! I have a brand new gelli plate so I need to break it in! Thank you for the lovely samples and link to tutorial!